Over the last three decades, family therapy has revolutionized the mental health field, changing the way human problems are conceived and therapy is conducted. In concert with the dynamic growth of family therapy, the field of family therapy training and supervision has also expanded enormously yielding many new ideas and skills. Yet, until now, few books have been devoted to it, and no single volume has attempted to relate the full breadth of this growing field in terms of its conceptual and theoretical expansion as well as its practical application. 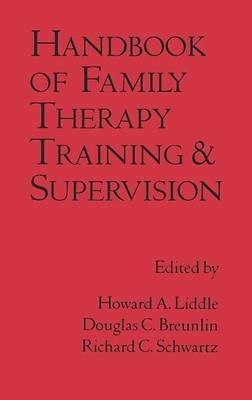 HANDBOOK OF FAMILY THERAPY TRAINING AND SUPERVISION fills this need by presenting a truly comprehensive view of this dynamic area. To accomplish this broad yet in-depth scope, editors Liddle, Breunlin, and Schwartz have assembled 30 highly acclaimed authorities to author chapters in their respective areas of expertise. For further clarification, the editors have included segues that introduce and analyze each of the book's four major sections providing the reader with an overview of the section, highlights of themes that run through it, and discussion of the issues raised in a way that ties the chapters together. approaches to training and supervision that have evolved in each separate school of family therapy. Offering a panoramic view of the entire field of family therapy, these seven chapters allow for fascinating comparisons among the different schools regarding the process by which ideas about therapy evolve into training techniques and philosophies. Section II follows with an explication of the pragmatics of family therapy supervision. Helping family therapy trainers avoid and anticipate the common mistakes involved with supervision, the skills described in this section create an atmosphere conducive to learning and maintaining a working trainer-trainee relationship, and finally, for training of supervisors. Practical guidelines for using live and video supervision are included. Section III features family therapy trainers in such diverse fields as psychiatry, psychology, family medicine, social work, nursing, free-standing and academic family therapy programs, who describe the problems and advantages they encounter teaching these new ideas within their idiosyncratic contexts. The book closes with a section that includes reflections on the field by such innovative and respected leaders as Cloe Madanes and Jay Haley. Among topics covered are perspectives and recommendations for researchers evaluating family therapy, practical advice for incorporating a cultural perspective into training programs, feedback on the experience of live supervision from trainees' perspectives. An appendix follows that provides over 400 references organized by subject for easy reference. Given the level and scope of this extraordinary text, FAMILY THERAPY TRAINING AND SUPERVISION is an invaluable resource for anyone interested in teaching, learning, or simply appreciating family therapy.